Startup Escalation 1999 2000 2001 2002 2003 2004 2005 2006 2007 2008 2009 2010 2011 2012 2013 2014 2015 . 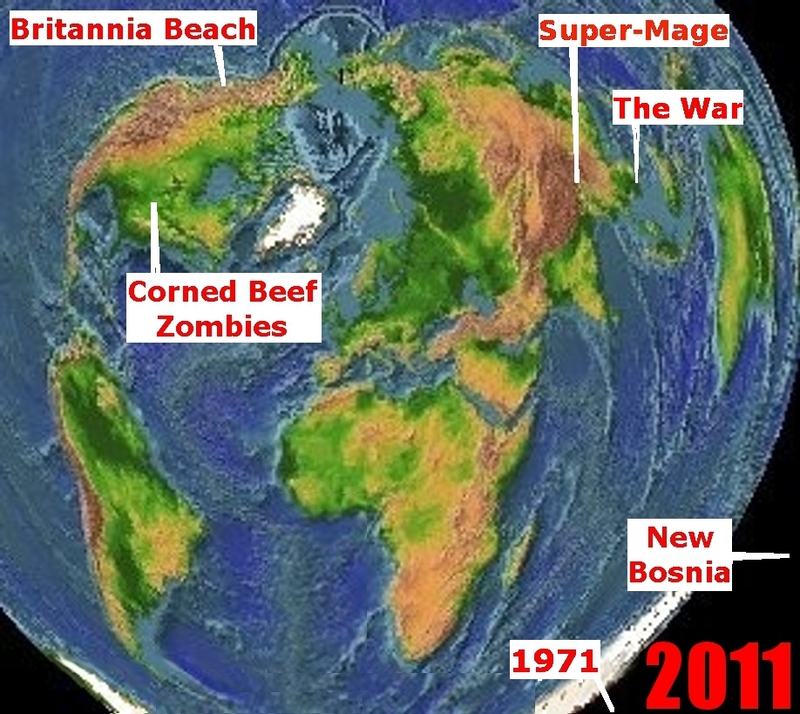 2011: (Deputy | Zombies) Wolf-Woman (Britannia Beach | Silver Skull) (Lateran | Rapture | New Bosnia : 1 : 2 : 3 : 4 : 5 : 6 : 7 : 8) | (Discontent: Villains | 2014 | Plan | War | 1971 | Deal | Agents | Myth | Strike | Report) Super-Mage Useless Surprise | (Endgame: 1 | 2) . Culture: (Tape: Trailer | Clip) | Stay Dead! | Iv | Powernaut . Superhuman World 2011 is a work of fiction. The characters herein and the commentary about them should not be considered "real". SW10: Superhuman World 2012 Annual: Satan Wants His Spine Back! The Donors of Satan gathered. Their leader plucked a monocle off his face, stuck a floating eye back in the empty socket underneath, and spoke. "Our Master's Eye has found what happened to His Spine. It lies in a pit in another world. Captured by magic cats." "Damned blockhead pets!" The sorceress across the table spouted flame. "Oh, I think the pets are to be commended for turning the tables on their torturer." The sorcerer next to her leaned back in his chair and arched his fingers. The leader said, "Still, Brother Iain, while we can agree the Spine's previous operator had it coming, Our Master requires his Spine." "Oh, surely He has misplaced body parts before." A second sorcerer spoke from a silver mouth - encased by a silver skull. "Indeed, Brother MANIC. The Wang of Satan usually rebuilds those. But the recent superhero Raptures have scythed into the Wang's preferred breeding stock. He prefers noble but corruptible. But the Super Savior Rapture took much of the corrupted righteous, and most of the other righteous went with the Powernaut Rapture. We need our current Spine. Besides, these others have taken what is ours. This cannot abide." The one other man at the table spoke. "Will it be cost-effective to retrieve it, though? Bear in mind, our supervision is needed for world politics. Even though Joe Corrigan has no successor-apparent for the U.S. Presidency, our lackey Trump will need considerable support in his own bid. And we do yet need to ensure Ellipsis is marginalized. Though he and his minions are useful for keeping the world running until Our Master can claim it, they should not get too much credit for same." "Brother Russell, thank you for your insightful political analysis as always, though your own grudges against Ellipsis are noted. But I am confident we can spare the power while we remain to lead. Our conclave has almost one hundred junior members to represent the less gloried parts of Satan. I already have one volunteer to lead the mission. We can reinforce him at need. We shall drown that Earth in Satan's own flame if need be!" The sorceress spoke again, "Uh, I have the flame. And one of the best of us got wasted by whatever was down that hole he got sucked into. How is cannon fodder gonna help?" "Simple, my dear Sister Lucy. Brother Brady was a trespasser where he went, and did not know the protocols there. My Eye has seen those now. This time, the Master's minions prevail." Brother Russell said, "Could you perhaps share the details, Brother Auge?" "Oh, I suppose... The first rule is, the powers of that realm name themselves as in old comic books. Something Boy, or Something Lass, along those lines. Our minions will each name themselves along the lines of Devil Body Part Kid this time. "Secondly, Brother Brady aroused the wrath of something called Miracle Pets by his acts of animal sacrifice to Our Lord. Our minions will not so attact their wrath." The sorceress Lucy said, "Oh, like Miracle Pets won't put their wrath on what they want." "Sister Lucy, do you have a constructive suggestion along those lines?" "Oh, I can construct... I know a lot about pets. There was this one dog when I was growing up. It's dead now, of course..."
"Would you care to share more with us?" "I'll share everything you want about that damn dog! I've got its bones at home! I dug them up! It gave me closure before I left town! I'll bring them here and raise the beast for you right now!" Lucy gestured. A box appeared. Brother Russell said, "She's going off again..."
"No, Brother, she has a point." Brother Auge gestured. "For total success against all possible obstacles, we should send our own Miracle Pet. The Eye has revealed, each Miracle Pet is named after a vegetable and a holiday. Sister Lucy, have you a suggestion?" "Richthofen the Stupid Miracle Beagle!" "You realize, Richthofen is not a vegetable and Stupid is not yet a holiday." "Okay, how about Stupid the Richthofen's Birthday Beagle?" Brother Russell asked, "What is it with you about the Barons von Richthofen?" "This damned dog always perched on his doghouse like a dogfighter! Like that World War One Red Baron!" Brother Auge spoke. "Passion is good for the naming. Sister Lucy, you have the naming privilege. What vegetable do you choose?" "Brussels sprouts! No! Lima beans! Those were the stupidest!" "So be it. We shall raise this beast together as Limabean the Richthofen's Birthday Miracle Beagle!" Brother Iain asked, "Uh, does anyone here know what the most famous Richthofen's birthday actually is?" "Thank you for your encyclopedic knowledge, Brother MANIC." Brother Auge continued, "So let it be!" The mages gestured. The beast arose. "Excellent. Summon the Buttocks of Satan." This is now published with a possibility of "collaborating" on the sequel just by posting it for review on the LNH author group, and thereby making yet another crappy claim in yet another RACC High Concept Challenge! But I do have to admit, I've been preparing this story for a while. This story wraps up some unfinished business from the RACC-Con Special story, "Who Killed the Cat With Glasses?" As an LNH story it concluded cleanly - remarkably so by Legion standards. But the LNH universe now has something which belongs to my own storyline, SW10 or Superhuman World 2012 (by the time of the story). I'd be happy to let the property rest there, but not all my characters feel that way. - The Fall of the Spine of Satan: RACC-Con Special, Who Killed the Cat with Glasses? wil.alambre.ca/racc/archive/read/1039/. (signed) Scott Eiler, 22 June 2013. Various characters in this fiction may have been created by various people. But absent claims from these people, all characters in this fiction and the phrase "Superhuman World 2011" are copyright © 2011 - 2015 by Eiler Technical Enterprises.